When a priceless Rembrandt is stolen in New York, the evidence points to a solitary master theif (Sean Connery), who is about to meet the insurance company's most cunning and seductive investigator (Catherine Zeta-Jones). Following a nerve-racking game of cat and mouse, the two join forces to attempt a daring multibillion dollar heist tied to the dawn of the new millennium. There are only a handful of buildings that break with the traditional rectilinear grid street plan of midtown and 101 Park Avenue is one of them. 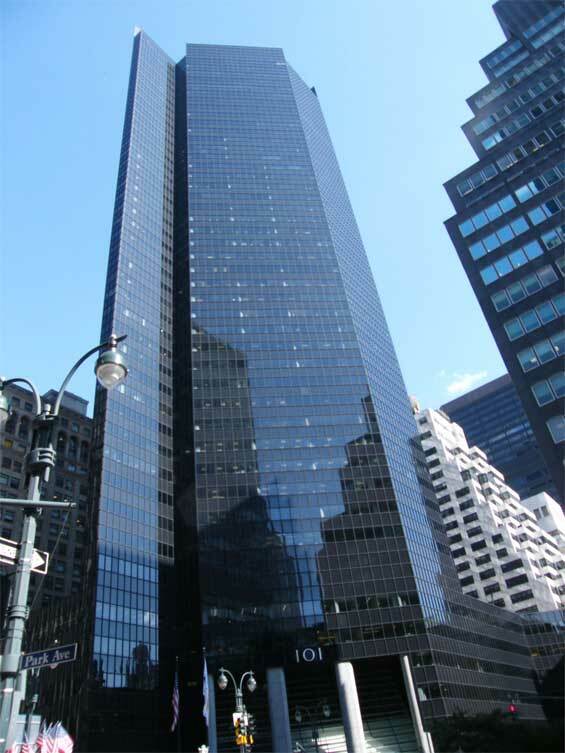 This big, rakishly angled 49-story tower on a steeply sloped site at the uptown entrance to the car ramp that wraps around Grand Central Terminal has its front entrance angled towards the southwest and set back in a large, stepped triangular plaza. Large rounded columns rise from within the entrance and break through the slanted windows, symbolizing dramatically the inside and outside nature of the space. The three-story lobby is broad but almost too severe. Indeed, this sharp-edged building presents a very aggressive stance and its dark, monochrome tone is too much "all business." But appearances are, as usual, very deceptive. At the rear of the elevator banks are escalators leading one level down to the less dramatic 41st Street entrance where a large and handsome newsstand and a wonderfully attractive and large, inexpensive cafeteria are located. The main lobby also leads to Club 101, a large private luncheon club that is fashioned somewhat after the Four Seasons Restaurant in the Seagram Building. The lobby could use some colorful art and its exposed columns that penetrate its slanted front should have been clad in rich polished granite or stainless steel rather than rough cut stone. For that matter, the columns should have been sharply angled rather than rounded at their ends to be consistent with the rest of the building's daring. A freestanding flagpole in the plaza is effect, but could be supplemented by more flagpoles and perhaps a large sculpture. The 41st Street corner at Park Avenue is built full to the building line. Above the low base at this corner, the tower rises without setback.